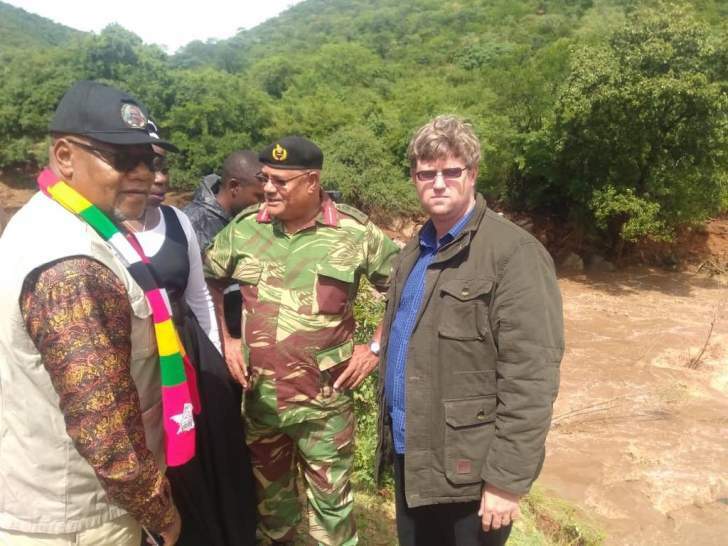 President Emmerson Mnangagwa and Vice President Constantino Chiwenga were both forced to defend a Zanu-PF MP as they toured areas ravaged by Cyclone Idai on Wednesday. Joshua Kurt Sacco, who won with a huge majority in elections last July to represent Chimanimani East, stood crestfallen after villagers, some of whom lost everything in the cyclone disaster, jeered when Chiwenga mentioned his name in Ngangu, a high density suburb of Chimanimani. Chiwenga was praising Sacco's efforts to raise the alarm about the devastation in the district when the crowd jeered. The Vice President had a torrid time getting the crowd to appreciate his point, and had to repeatedly ask them "please be quiet" and "please listen". "For the police and the soldiers to get to you," Chiwenga said referring to impassable roads and destroyed bridges which delayed rescue efforts, "we were working with Sacco. He's the one who woke us up on Saturday to tell us of the tragedy that had occurred here." Chiwenga also credited Sacco's local knowledge for navigating backroads in order to reach Ngangu after the main highway was cut off with several bridges swept away. Sacco won Chimanimani East with 16,492 votes, defeating the MDC's Maxwell Mdhluri who polled 3,034 votes. But locals appeared intensely unhappy with him, and this appeared to surprise Mnangagwa and Chiwenga. "This one that you say you don't like, I like him," Mnangagwa said, tapping Sacco on the shoulder. "That's your problem (that you dislike him) because I as the ruler of this country, who rules over you, I like him." Mnangagwa said Sacco had kept them fully briefed about the developing disaster, and his information had been critical in mobilising aid. The military said on Monday that it expects that when the final death toll is determined, upwards of 500 people would be dead or missing presumed dead. Flood waters which destroyed homes in Manicaland had swept some locals who had taken shelter inside their homes, sometimes whole families, up to the rivers and onward to Mozambique, Mnangagwa said. "We will bring them home," Mnangagwa pledged. Mnangagwa also warned against corruption in the distribution of food and other material donor aid, warning that there would be "special punishment" for anyone found stealing.